Imagine you’re in the middle of a heat wave. Stuck inside, chilling by the good ol’ AC, you decide to look for something good on TV. You’re flicking through the channels when — BAM! — you land on a movie, right in the middle of the action. You’re intrigued, but full of questions. What’s going on? Why are they fighting? Where are they? Why are they dressed like that? This is how someone new to your email list feels, before getting acquainted with your business. They sign up, and one day (sometimes long after they initially signed up), they get one of your regular newsletters, which contains a lot of information that they don’t quite understand. Sure, they’re interested. But they also might feel confused and slightly perturbed. Why a Welcome Email puts your subscribers at ease. A Welcome Email is the perfect way to greet your new subscribers and ease them into your list before they start getting your regular communications. Welcome emails should be a part of your email marketing strategy — with a Welcome Email, you increase the likelihood that your subscriber stays engaged with your business and becomes a great, loyal customer. It’s as simple and as important as saying hello to someone when they walk into your establishment, and it creates a lasting positive first impression. But the truth is, your Welcome Email isn’t enough on its own. To effectively welcome new subscribers, you have to go beyond a Welcome Email, and set up a Welcome Series for the onboarding process. When you’re only sending a Welcome Email, the tendency is to overstuff it with information. The more you try to add to a single message the less effective your email becomes. You run the risk of overwhelming people who are new to your business. 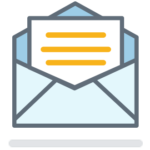 A Welcome Email will also tend to have a higher open rate compared to other mailings. It is prime time for your best content, so if you don’t send multiple messages, you miss the opportunity to get your business in front of your contact multiple times at a point when they’re highly engaged. Take advantage of the momentum in the beginning by sending a series of three emails over the course of a week. 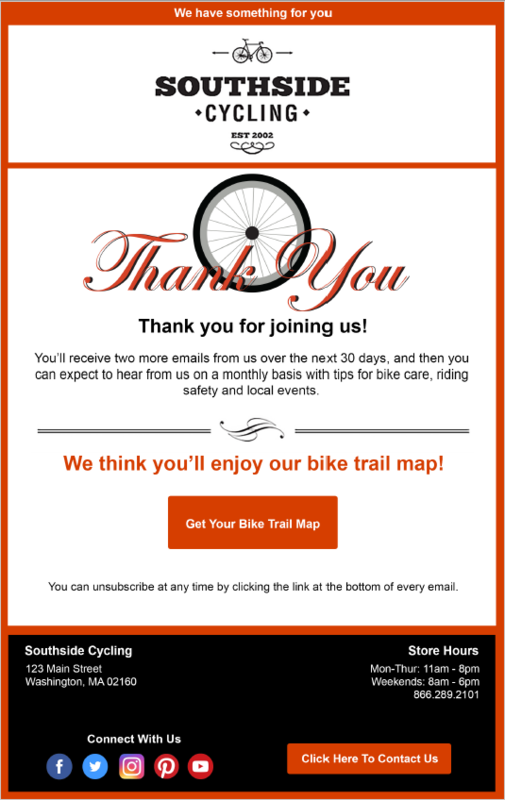 What should you include in a Welcome Series Email Campaign? We recently showed you the three emails every automated welcome series must have. Let’s review the three emails, their purpose, and the desired result of each. The Purpose: This email is the very first communication a subscriber will receive from you, so it should delight them with an offer fulfillment and outstanding content and design, and your brand. As the saying goes, “You never get a second chance to make a good first impression.” This email should “WOW” them and provide some instant gratification immediately after they sign up. The Result: By providing a positive first impression, you’re setting a precedent that your emails are worth opening. The goal is to impress them so much that they look forward to opening your next email. The Purpose: Your second email should get your audience to take that next step in engaging more with your business. If you work hard to maintain a good following on your social media accounts, now’s your time to show it off! Ask your new subscribers to engage with you there and make it super simple for them to do so with social media buttons. 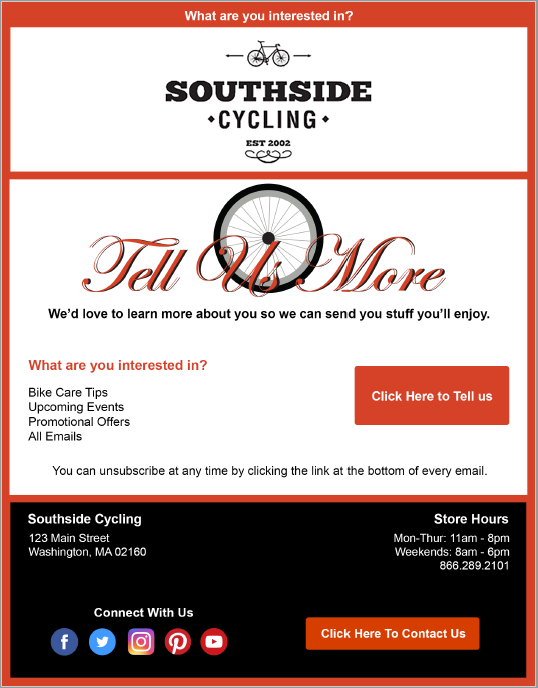 Send this email out a couple of days after your initial email, so your business stays top-of-mind. 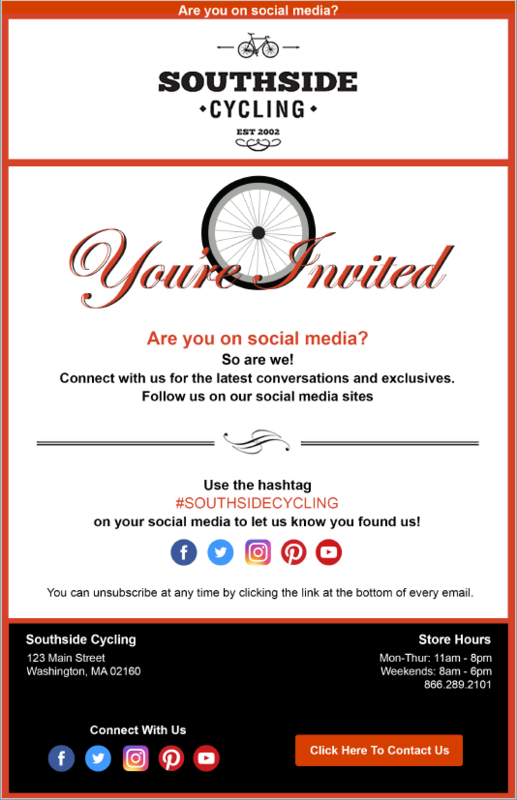 The Result: This email will drive more followers to your social channels. Over time they’ll see your beautiful images, videos, and posts that all lead to a better understanding of who you are and how you can service them. The Purpose: This email allows you to get to know your subscribers better by asking them about their own interests and opinions. Ask them to fill out a brief online survey or questionnaire to find out which topics they’re most interested in reading about. Or encourage them to provide their birthday so you can send them a special gift each year. The Result: By learning more about what your subscribers are interested in, you have more information to create targeted mailings designed to reach the right person with the right offer. The more you know about your subscribers, the easier it is for you to connect with them and drive action. You’re ready to create a Welcome Series campaign for your business. Use these tips as a guide while you work on your email marketing campaigns, then customize your future emails to match the tone and personality of your business. Whatever you choose to include, make sure to include “evergreen content,” meaning content that will not need updating or revamping for a very long time. Don’t include links or elements that change often. There’s nothing worse than sending out a special offer that’s already expired! Keep timelessness in mind when setting up your email series and you won’t have to worry about going back and making updates. Looking for more help with your automated Welcome Series? We’ll show you how to do it in our free recorded webinar: How to Create a Welcome Series to Increase Sales and Engagement. See why smart small businesses use email marketing to drive more business. We'll show you exactly what it can do for you, and ten tips to get started.